Here at homify we witness an abundance of contemporary homes, each attempting to evoke a sense of individuality, intrigue, and uniqueness. With so many new homes on the market, it is often difficult to be surprised by a newly constructed contemporary home. However, when we came across this dwelling from Vismaracorsi Arquitectos, we were surprised. Not only is this residence light-filled, airy and intriguing, but it is gorgeously inventive and innovative. 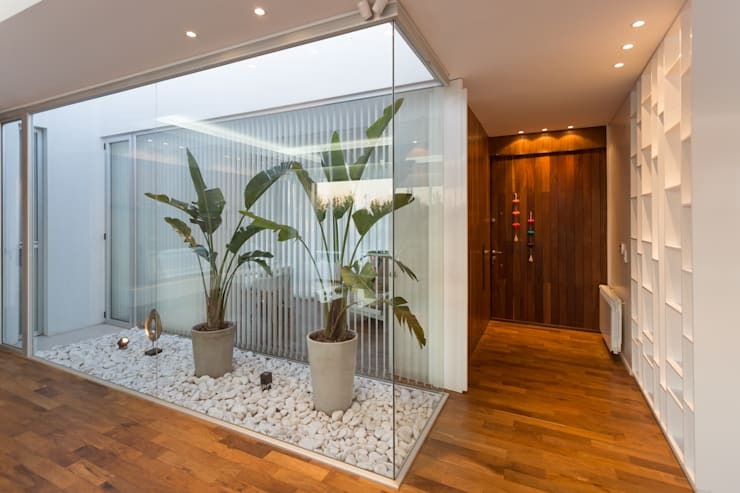 Casa C Puerto Roldan is a modern cubist dream home. Boasting privacy from neighbouring homes, while maintaining a well-illuminated interior, this is a memorable and distinctive residential experience. 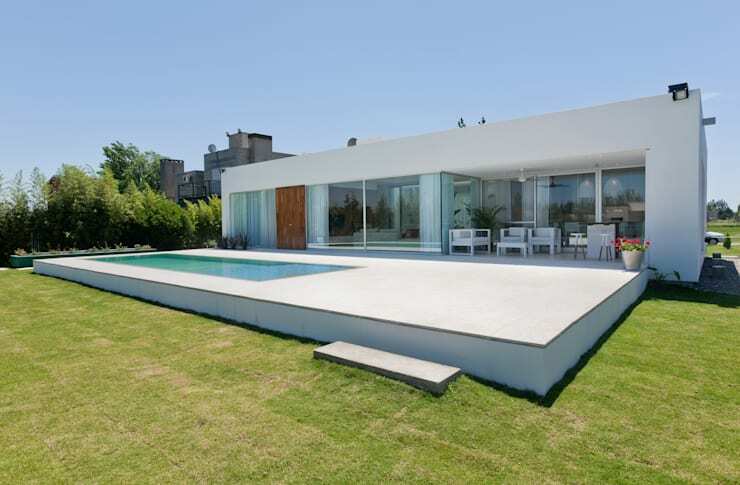 Situated in a private community, 30 kilometres from the city of Rosario, Argentina, this home is essentially a white rectangular prism, with recessed sections, and well-integrated social areas. Replete with an internal courtyard, home office, living room, kitchen, swimming pool, bedroom, ensuite, guest quarters, and a huge exterior entertaining space, this house comes complete with everything one could possibly require for stylish 21st century living. If you would like to take a peek inside, check out the images below, and gain a few tips and tricks for your new home or domestic refurbishment. 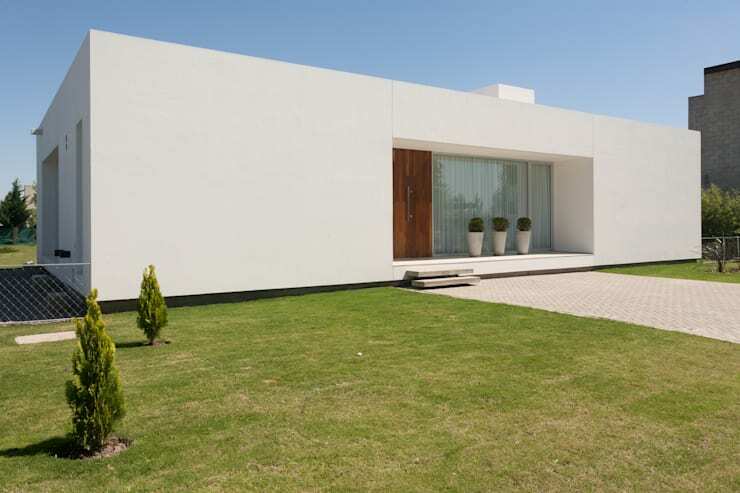 As we approach the Casa C Puerto Roldan, we see the stunning cubist form, and wonderful minimalist designed structure. A small garden surrounds the abode, with the driveway leading up to the dark timber entrance. Closed off from the street, the exterior fascia has very few windows or openings, again cementing itself as a cube-like building and home. Privacy is guaranteed due to the lack of windows to the street and neighbouring homes, ensuring the dwelling is secluded and isolated from noise and distraction. The entrance itself is enigmatic, offering contrast against the all-white façade, yet still simple in its approach and design. In contrast to the front of the home, the rear of the property presents us with a very different sight. The exterior wall, unlike the entrance, is awash with windows, and boasts an abundance of glazing. The house opens up to the garden, and offers the occupant an area of interest and intriguing domestic living zones. Modular in its design, the swimming pool is essentially another component of the home, working in conjunction with the cubist shape and form of the structure. Scenery communicates directly with the dwelling, with the pool and terrace adding liveability and comfort to the residential environment. The architectural language of the house is one of modernity and contemporary spirit. Boasting linear forms and strikingly sharp design features, this is truly an unforgettable home! Although this dwelling appears ultra-modern and minimalist, it surprisingly creates a sense of connectedness with nature and the natural environment. As we enter the interior entrance, we see the lightwell that offers the abode plentiful illumination. Ventilation is guaranteed, ensuring an airiness that is often overlooked within contemporary dwellings. Recessed windows and dividing walls offer a fresh, modern design, again enhancing the overall ambience and atmosphere within. The study sits in the small room next to the front door, with light on both sides provided by floor to ceiling walls of glass. As we enter the living room we are presented with a gorgeously welcoming space that boasts comfortable furnishings and an overall sense of hospitality. Employing large pieces of glass, and huge full-height windows, the dining room and kitchen communicate beautifully with the garden. Light hues and shades are gorgeously incorporated to evoke airiness and spaciousness. Providing contrast to the almost all-white interior, dark tones are employed as small details in the contemporary furniture, and through the smart use of accessories. Lighting is brought into the living area through the abundance use of windows, while the recessed ceiling space offers downlights that exude warmth during the evening. This room is unique, and a highly original demonstration of different contemporary elements that ensure the home is elegant and timeless. Within the kitchen and dining room the standout feature is undoubtedly the highly unique exhaust fan that sits directly over the cooktop within the floating island. The joinery rejects the use of fittings, instead opting for sleek minimalism, evocative of modern minimalism. A dividing wall of shelves provides ample storage for curios, objet d’art, and effortlessly completes the space. Like the rest of the house, the colour employed is a crisp white hue. The rooms therefore feel open and airy, with space maximised, and a feeling of cleanliness. Adding contrast to the interior the dining chairs are upholstered in bright fabric, with the dark timber flooring providing depth and intrigue. Have you ever wanted the perfect entertaining space? An area that you can invite friends, family, and guests, for a fabulously enjoyable and fancy time? If the answer is yes, then you are going to love this exterior courtyard. As the final image of this unbelievable dwelling, we take a look within the outdoor terrace. The space-age style outdoor kitchen is an eye-catching highlight, while the seating is a contemporary take on traditional timber deck furniture. 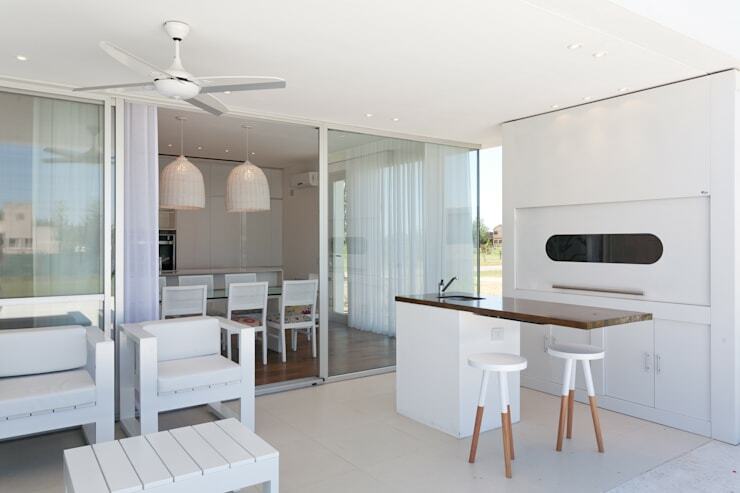 The colour scheme is again white, ensuring continuity between the interior and exterior spaces. This is an ideal space to entertain, and a perfectly adorned area with all the necessary amenities. Recessed downlights offer lighting during the evening, perfect for opening up the bar, preparing a few cocktails, and throwing a truly fabulous pool party. If you take another look at the first image within this Ideabook, you will notice the position and situation of this patio area. It is contained within with cube-like shape of the house, meaning it will stay dry during inclement weather, or shady during the summertime. This home is one of a kind. It is a unique contemporary dwelling with its design roots firmly placed within the 20th century, a time of innovation, creativity, and originality. Could you live in the White Cube House? We'd love to hear from you in the comments below!